On October 29, 1957, Scandinavian Airlines Flight 912 departed Idlewild Airport, (Today known as J.F. K. Airport) in New York bound for Copenhagen, Denmark. The aircraft was a DC-7C with Danish Registry OY-KNB. At approximately 5:15 p.m., while about 200 miles off the coast of Maine, the No. 1 engine on the left wing began running erratically and then the propeller began to over speed at 4,000 r.p.m. The crew tried to feather the prop but without results. Then sparks and flame appeared around the engine cowling. 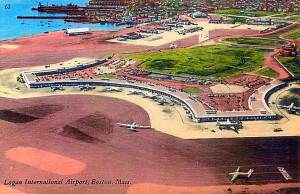 The pilot declared an emergency and descended to 8,000 feet while receiving routing instructions to return to Idlewild, which were later changed to Boston’s Logan Airport which was closer than New York. Meanwhile, a Coast Guard plane was dispatched from Quonset Point Naval Air Station in Rhode Island and intercepted Flight 912 at 7:42 p.m.
As Flight 912 was making its approach to Boston at 4,000 feet the spinning propeller broke free and fell into the sea. The aircraft made a safe landing at Boston on runway 22L where it was met by fire crews who sprayed foam over the left wing as a precautionary measure. There were no injuries reported, and occupants of the plane departed safely.